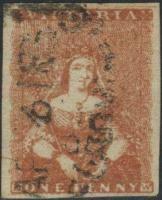 The first issue is without frame lines. Frame lines were added in the third "state" of the dies. Scott prices appear to match the less expensive S.G. #12 - 14, so beware when you buy, you may get what you pay for! Get an overview of Australia and Colonies 1850 - 1913. Page expanded in the rewrite. 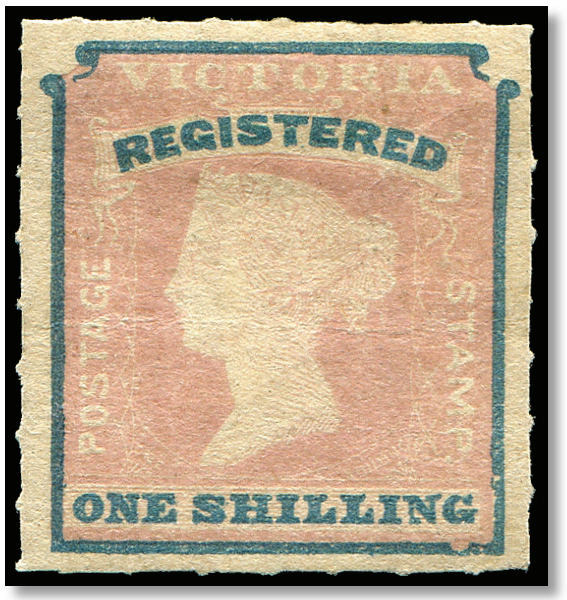 Victoria issued the world's first Registration stamp and Late Fee stamp (SG33 Sc-I1) on 1st December 1854 and and 1st January 1855 respectively. Gibbons  states SG34 "was used to pay the registration fee and was so used until 5th January 1858 after which remaining stocks were used for normal postage" and SG33 "was provided to pay the additional fee on letters posted after the normal closure of the mails … [the] service was withdrawn on 30th June 1857 and remaining stocks … used for normal postal purposes". “Too late or late fee stamps were applied to mail to indicate payment of a special fee that would ensure acceptance of an item after the normal closing of a mail. 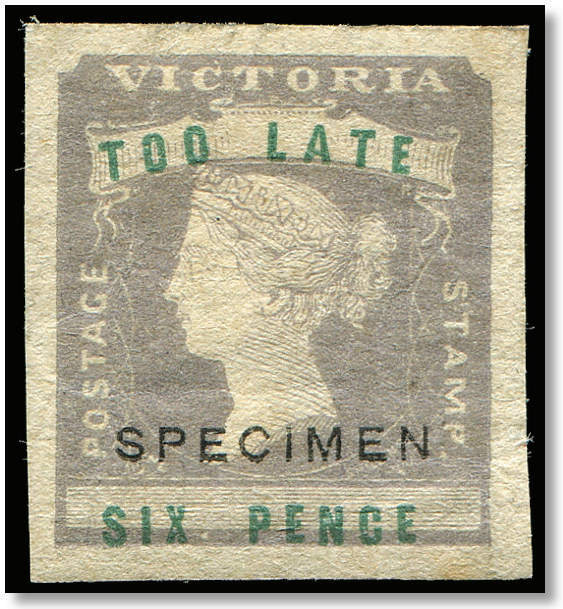 The colony of Victoria, in Australia, issued a Too Late stamp on Jan 1 1855. In 1923 Denmark issued a late fee stamp bearing the overprint "GEBYR" followed in 1926 by a stamp inscribed "GEBYRMAERKE". The stamps were used until 1934. Sources: KW1 , ScC, SGP1  . Images from Glen Stephens Stamps.